The weather service says the smoke won't be as bad as this past week, but that it will carry into the weekend. Just when people in the Seattle area thought the haze was over, it has rolled and could add a thin layer of smoke to the weekend. But it isn’t expected be as thick as what we just experienced, according to the National Weather Service in Seattle. Weather Service meteorologist Dana Felton said the haze returned due to two factors: low-level, west and southwesterly winds, which were pulling smoke from the Maple fire in the Olympics over the Seattle metro area, and an upper-level trough moving northwesterly that pulled smoke down from the fires on Vancouver Island, B.C. 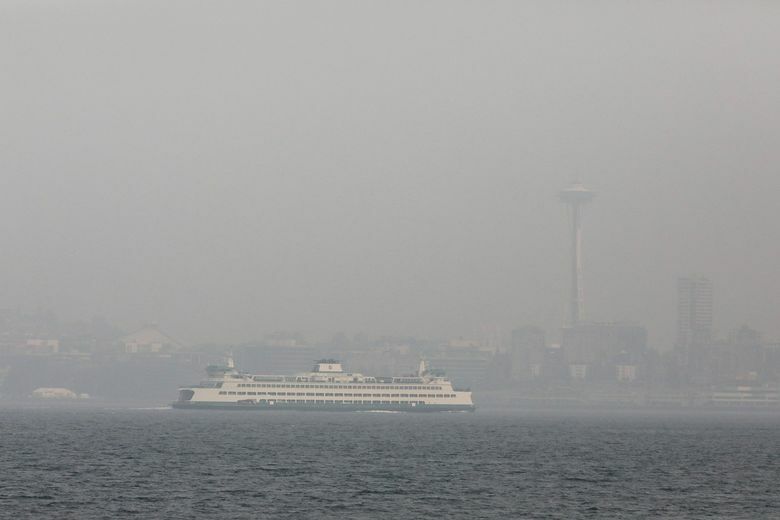 Seattle air quality readings vary. Here’s how to interpret them through the haze. If the wind shifts again and blows down from due north, we could see a return of the heavy smoke from mainland British Columbia next week. Felton said that the smoke this weekend shouldn’t be as bad as this past week, but that it could carry into next week. With the possibility of longer-term smoke exposure, public health experts are urging all people — not just those in sensitive groups — to limit exposure. Sverre Vdeal, a physician with the University of Washington Department of Environmental and Occupational Health Sciences, said the consequences of long-term exposure to wildfire smoke on people are not yet clear, though scientists are currently analyzing data gathered during the 2017 wildfires. “We do know though that the cumulative effect of long term exposure has a greater impact on health than just a single day,” he said. Julie Fox, an air quality specialist with the state Department of Health, said wildfire smoke is known to have an impact on people over 65 with pre-existing conditions, such as lung disease and cardiovascular disease. She said there is also growing evidence that it has an impact on children, pregnant woman who may risk preterm birth, people with diabetes and people who have a history of strokes. Vdeal said that, perhaps surprisingly, early study results suggest that it’s not the elderly most affected by the smoke, but middle-aged and younger people who were hospitalized as a result of it. Nobody knows why, he said, but there is speculation that younger, healthier people may dismiss the risks and continue their outdoor activities. Liz Coleman, a spokeswoman for the Environmental Public Health Division of the Department of Health, said her agency saw an increased need for medical care among young healthy adults during one of our extended stretches of hot weather. She said she wondered then whether it was because younger people may feel invulnerable. “They might think, ‘It’s not going to affect me. I can still go out and run five miles’,” Coleman said.